Ferritic coating of graphite in flake graphite cast iron or nodular graphite cast iron. 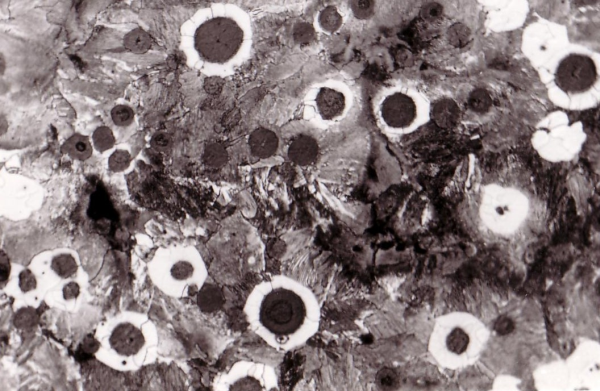 In particular for pearlitic types, silicon accumulation around the spherolites promotes formation of ferrite areas. 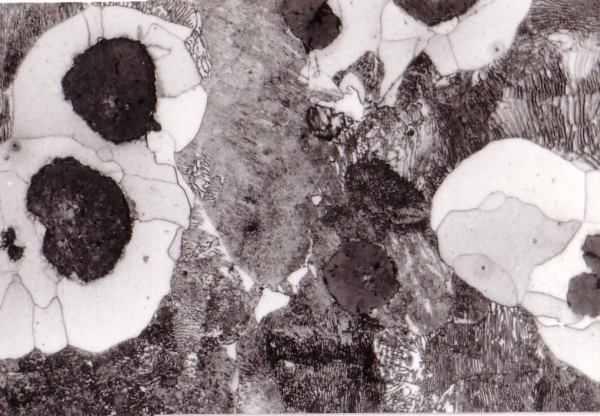 Ferrite and pearlite are formed during eutectoid transformation of austenite (s. in the Iron-carbon phase diagram). These types of structures also referred to as “bulls-eye ferrite” impair crack propagation from graphite and thus increase fracture toughness of the material. Figures 1 to 2 show the different formations of ferrite borders in nodular graphite cast iron.